He continued: “I am sure difficulties will be put in our way because the last thing the English Government wants to see is a representative body sitting here in Ireland and sustained by the whole strength of the Irish People. But when we have that assembly in being we will have taken a longer step towards Irish Independence than has been taken in 120 years.” This call for the sovereign independence of Ireland was reiterated by other speakers throughout the Ard Fheis. With Arthur Griffith standing down as president of the organisation which he had founded in 1905, Éamon de Valera was elected president of Sinn Féin. Éamon de Valera addressed the people, stating that the new policy of Sinn Féin was to secure the international recognition of Ireland as an independent Irish Republic – before this, Griffith had endorsed the idea of a dual monarchy which he thought would be more palatable to the British, but was unacceptable to the many factions of nationalist and republican now forming within Sinn Féin. 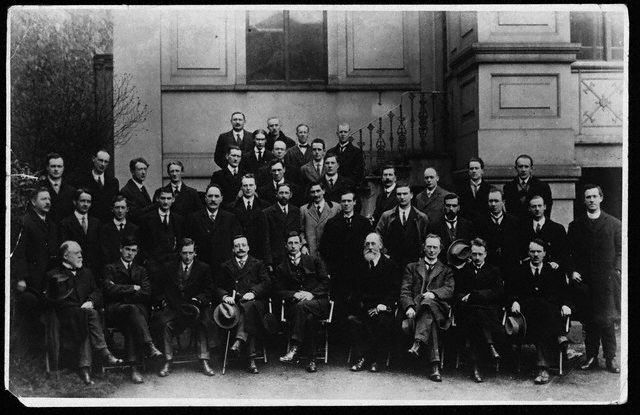 After the Ard Fheis, Sinn Féin’s fervour for political action gained traction throughout Ireland, ultimately culminating in their landslide victory in the December 1918 General Election. Of the 105 Irish seats, Sinn Féin won 73, and thereafter set about organising the First Dáil. All Irish MPs were invited to attending the meeting of the First Dáil in Mansion House, 21 January 1919, and notably the only unionist to respond to the invitation was Mr TJS Harbison, MP for North East Tyrone. In his letter acknowledging the invitation, he said he declined to attend “for obvious reasons”, but expressed his “entire sympathy with the demand of Ireland for a hearing of her just Cause at the Congress of the Nations”. The proceedings of the First Dáil were conducted in Irish, and since Éamon de Valera and Arthur Griffith were of the over 30 TDs marked as ‘fé ghlas ag Gallaibh’ (imprisoned by the foreign enemy), Cathal Brugha was appointed temporary President of Dáil Éireann. Cathal Brugha was Ceann Comhairle for the day, and the proceedings which had been organised weeks in advance followed with the reading of the provisional Constitution of the Dáil, the Declaration of Irish Independence and a Message to the Free Nations of the World calling upon every free nation to uphold Ireland’s “national claim to complete independence as an Irish Republic – against the arrogant pretensions of England founded in fraud and sustained only by an overwhelming military occupation”. 21 January 1919 was also the day that members of the Irish Volunteers shot two RIC policemen in Soloheadbeg, regarded by many as the beginning of the Irish War of Independence. As a story in need of telling on its own, next week’s Irish Legal Heritage will cover the Soloheadbeg Ambush and the beginning of the War of Independence.